UAS uses in the INFRASTRUCTURE | UTILITIES sector enable users to conduct inspections to determine the condition of infrastructure features, such as vertical utility towers and horizontal pipelines. UAS uses within this sector are commonly executed near infrastructure and require high-quality sensors to detect and assess the condition of infrastructure features. Due to the need for detailed images, camera photo and video quality are key attributes for uses in this sector. Vertical Infrastructure Inspection (VII) entails use of a UAS to collect information on the condition of vertical structures, such as power line transmission towers, water towers and other fixed vertical features. These use generally require operation of the UAS in close proximity to and potentially inside the structure of inspected features. Collection of specific information to assess the condition of key features of the infrastructure and/or aspects impact structure suitability for continued service. UAS use will decrease the risk and cost associated with infrastructure inspection by reducing or completely replacing the need to put human inspectors in elevated and potentially risky locations to conduct needed inspections. Specialized Sensor Requirements: Due to the need to examine soil and vegetation features often not possible with standard cameras, this use often demands use of specialized sensor packages. These packages can add significant cost and potentially weight to the total UAS. Enhanced UAS Training: This use requires operation of UASs in often challenging environmental conditions, to include high winds and potential electromagnetic interference. 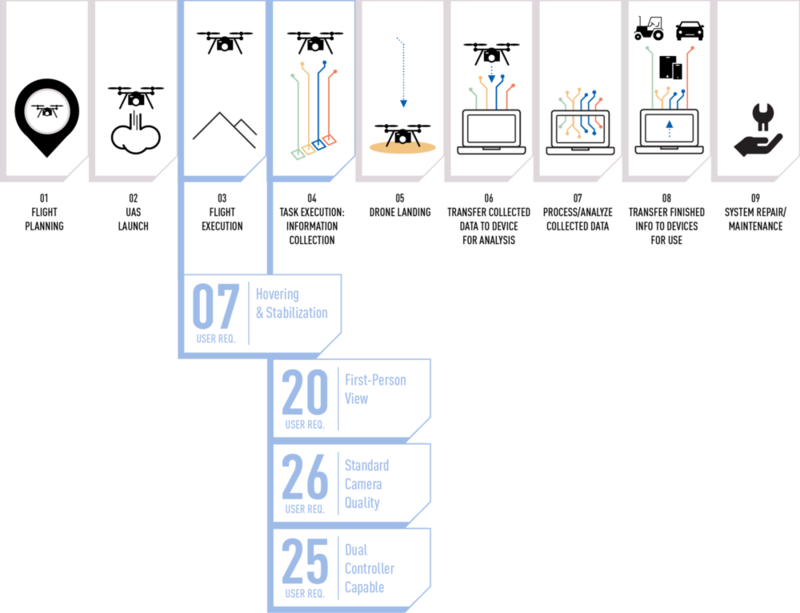 These factors can require UAS operator ability to manage unexpected UAS actions and emergencies, such as the temporary loss of controller and/or downlink signal. Structure Familiarity: This use’s need to examine detailed features of vertical structures generally requires an operator familiar with the specific composition and features of the structure inspected. Linear Infrastructure Inspection (LII) entails use of a UAS to collect information on the condition of linear structures, such as pipelines, railroads, and power lines. These use generally require operation of the UAS over long distances, emphasizing flight time and maximum controller distance. Current FAA regulations limiting UAS operation to line of sight (LOS) are often significant challenges for efficient execution of this use. Collection of specific information to assess the condition of key features of the infrastructure and/or aspects impact horizontal structure suitability for continued service. UAS use will decrease the cost associated with infrastructure inspection by reducing or completely replacing the need for human inspectors to walk the full length of linear infrastructure to inspect. 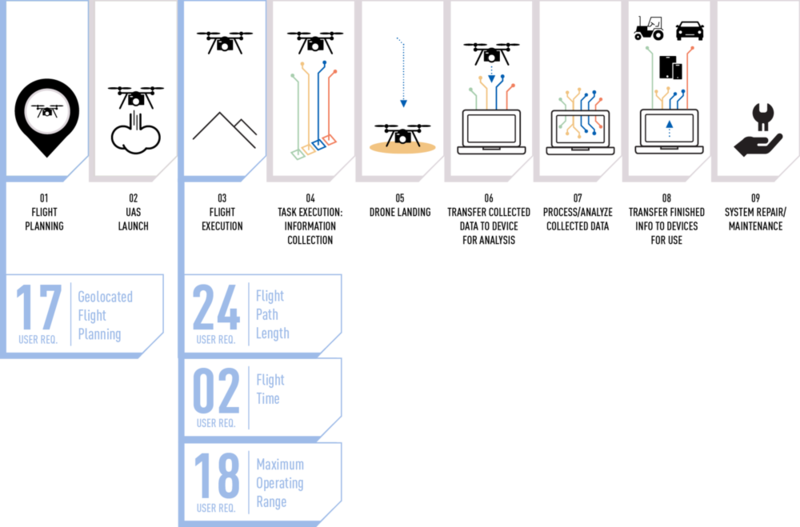 Need for Re-positioning of Operator and Controller: Current FAA requirements to operate UASs within the operator line of sight (LOS) generally require movement of the UAS operator to cover extensive distances. This requires UAS and support capabilities (vehicle, etc.) that enable frequent re-positioning.